Our week in Bangkok has flown by. We finally got our bearings and decided to try some street food, check out a temple, and meet some other backpackers. 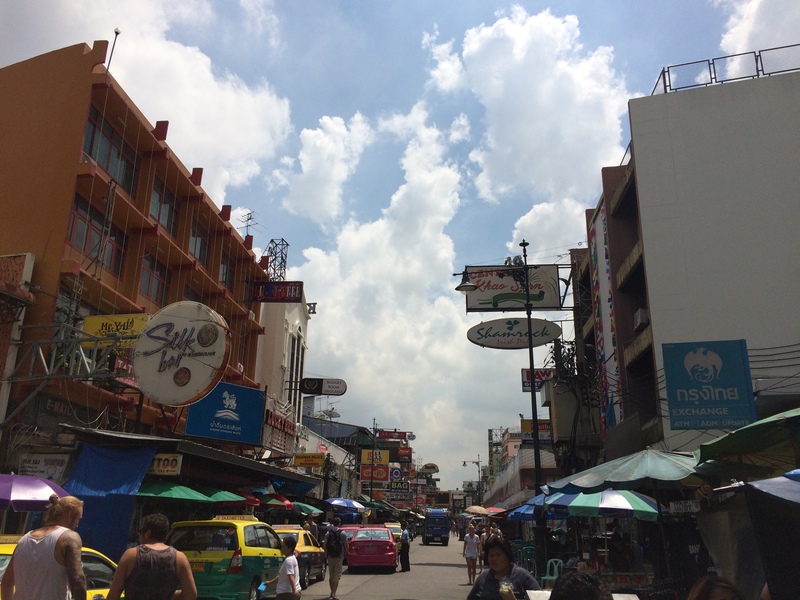 We felt a bit lost in Bangkok, so our hostel host mentioned we should check out the backpackers’ street, Khao San Road. It was a 10 minute walk from our hostel and when we got there, we could tell why it was aptly named. Almost everything was in English, Thai locals were selling everything under the sun, Lady Gaga music was blasting from open bars, and there was a sea of other backpackers. Luke decided he needed some lighter shorts, so we haggled with some venders to get him two pairs for $12 CAD. We sat down and had some Pad Thai and garlic chicken, watching all sorts of backpackers walk past. While it was a welcome change to the confusion that Bangkok had been thus far, it still left a bad taste in our mouths. Seeing hordes of loud, obnoxious and predominantly very white pedestrians from our restaurant table was at first amusing, then disheartening. Is this how we looked to the Thai locals? Our bar had a band of overly vocal Aussies draining draft beer from a tower, and the bar across the street wasn’t faring much better. Still, we were eating something that had an English label on it, so we took the good with the bad. After that, we headed back to our hostel to meet up with some friends so we could head to the vegetarian food festival in Chinatown. The seven of us piled into two Tuk Tuks and swerved through rush hour traffic before hitting the busy Chinatown festival. The streets were packed and there were food venders everywhere. At long last it was time to dig into Thai street food in earnest. We ate veggie fried noodles, roasted chestnuts, and a delicious cashew fruit slushie. If you’re not sure what to picture when we say cashew fruit slushie, don’t worry – neither did we. It looked like a Sunny D concoction, but tasted like they had added butter and some subtle herbs. We tried imitation sausage, which was tofu seasoned and seared just right. For sweets, we had coconut griddle dumplings and pure frozen coconut ice cream. 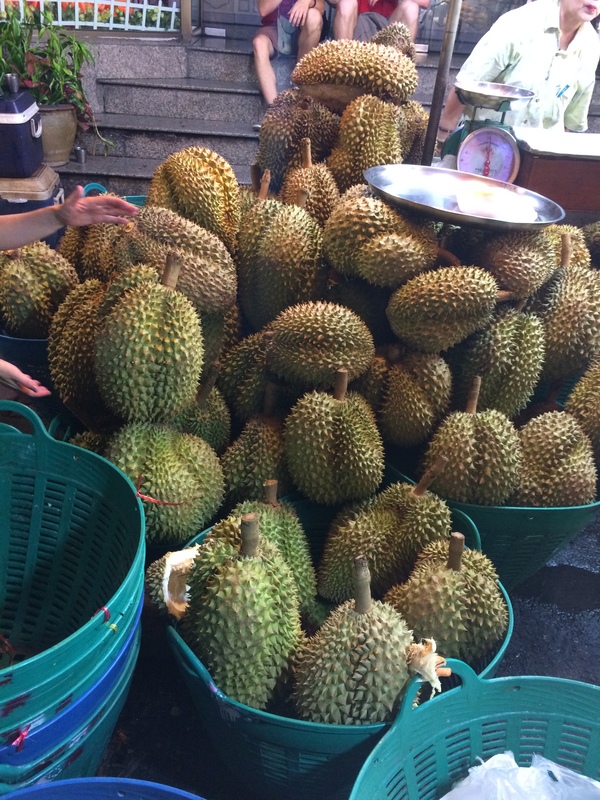 There was a man selling Durian fruit, which could be described as a mix between avocado, mango, a spike ball and a stink bomb. Our American friend told us that it’s illegal to transport fresh Durian on public transit in the United States on account of the smell. To get to the edible part, you have to crack open and discard nearly 80% of the fruit matter to get to the heart of it. Our verdict: It tasted pretty gross. It had the texture of foam but had a sweeter taste with a sulphur finish. The next day, we woke up nice and early to check out of our hostel. After I made sure Luke didn’t forget anything, we wandered towards our first temple in Thailand. 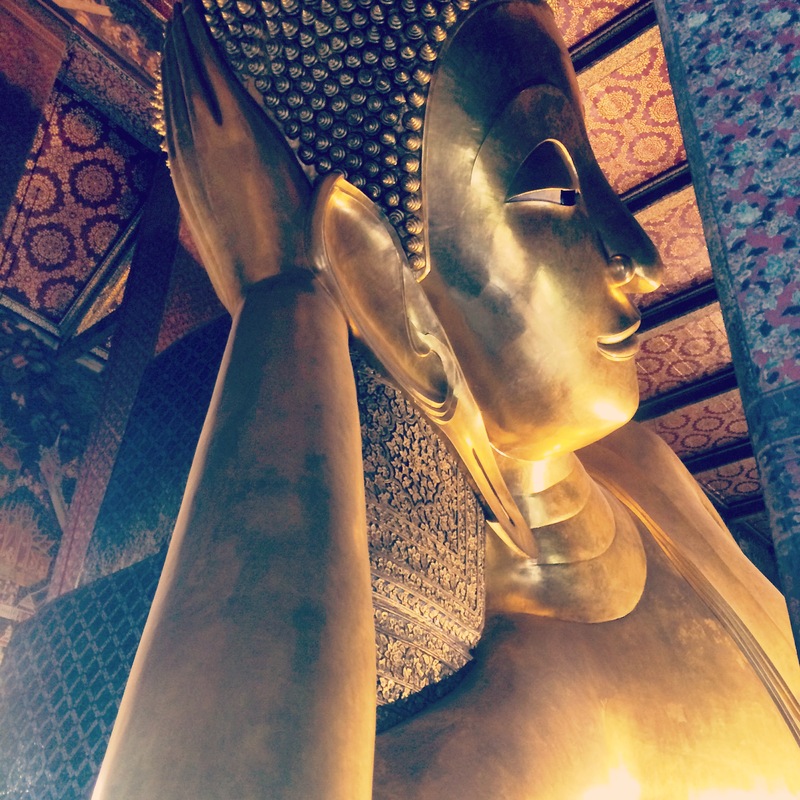 We had decided on Wat Pho so we could see the Reclining Buddha. This Buddha is 43 metres long and fully ensconced in gold leaf; the feet have over 100 symbols of Buddha engraved on it. To say impressive and ornate would be an understatement. The entire chamber seemed unable to fully showcase the beauty and overwhelming size. The entire area was awe-inspiring. Beautiful gardens, many little Buddha’s, all wrapped in gold-leaf, mini-waterfalls, and decorative bonsai trees, all littered the grounds. Since it’s Thailand’s rainy season, we got caught in the daily monsoon-style rain at the end of our tour. We took cover in one of the shrines while the water absolutely beat down for an hour, but we didn’t mind. When the rain let up, we headed back to our hostel and collected our bags and headed to the train station. Up next, our overnight trip on the Oriental Express. Just to say that I am enjoying your blog. Have you any plans to try travelling by motorcycle? Thanks so much. We actually rented a motorcycle yesterday in Chiang Mai. You’ll see a post about that soon, I promise!